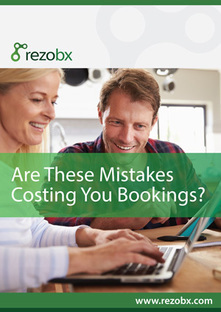 Are These Mistakes Costing You Bookings? Get your free ebook to find out how you can increase the number of bookings. When you bought your holiday house, you had grand visions. An investment which could bring in some cash as a rental. But now you’ve discovered that renting out your house isn’t as simple as you thought. Most importantly, you need to get bookings! In an effort to get more bookings, you have listed your home on a variety of third-party websites, but did you know these might be costing your bookings? Common mistakes that cost homeowners bookings. How to avoid these mistakes. Tips and tricks guaranteed to bring you more bookings. What software and tools will assist with additional booking. You'll recieve eBook instantly in PDF format to view on mobile, tablet & desktop. "Customers can go online to make a booking and it automatically places bookings into the beds and rooms. We are always very busy and it saves me so much time because I don't have to double enter. I couldn't live without it." "Thank you for your assistance. In particular to your Sales and Customer Service team, including your tech team member that setup our website book now button, were very prompt, friendly and professional." "Rezobx it easy to use. A necessary and great tool to have, especially on your website! It's great getting your money directly into your bank account"